While I understand the general process at work here, I am confused about his equivalences: the proto-rhythmic unit that is supposed to be equivalent to a whole-note appears instead to be equivalent to a dotted half-note. Or am I reading this wrong? It doesn't appear to be a misprint, as the other smaller units are proportionally related to the whole-note unit. 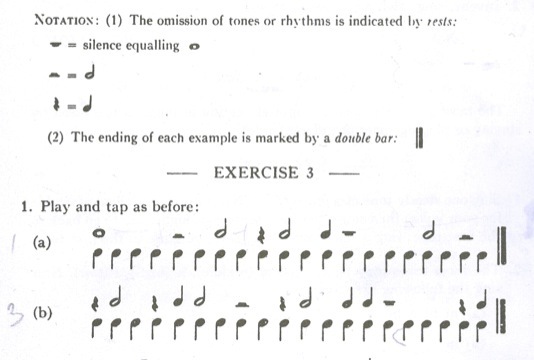 But wouldn't the proto-rhythmic unit in Exercise A be more correctly said to equal a whole-note? And the unit in Exercise C a quarter-note? Which would seem to concur with my assessment of Hindemith's proto-notation. So, is he mistaken? Or am I failing to understand some fundamental aspect of duration in rhythm? How would these exercises be correctly performed? How does he get from the proto-notation to common rhythmic notation? 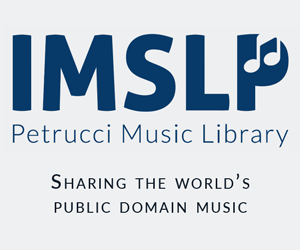 In Canada, "Elementary Training For Musicians" is in the public domain. So if you are Canadian, or a scofflaw, you can find a PDF of the book here. 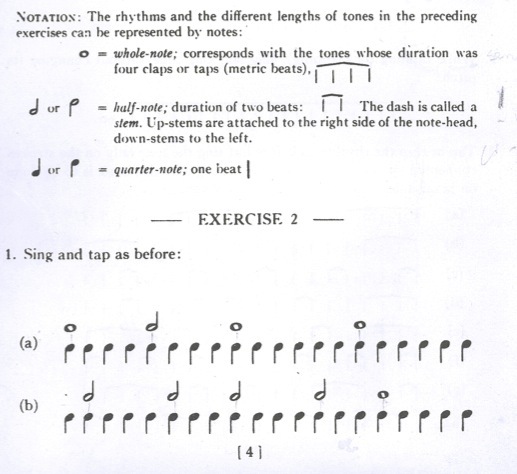 The exercises and notation equivalences are on pages 3-4 of the book. Don't know what page of the PDF. This is an absolutely fantastic book for helping with aural training. But you're absolutely right, this small section is quite misleading. In his example it looks like you vocalise through three taps and stop vocalising on the fourth tap, which would make the length of the vocalisation only three beats! I don't think you need to read too much into this; he is simply equating a four-beat note (semibreve or whole-note) with four tapped beats, but as you say the example is rather misleading. In fact, this is an issue that I find needs addressing quite early on when teaching pupils; ensuring that notes are held for their full duration, and not just until you count the last beat of a note. The notation on the surface is understandable, but at first seems confusing especially since the beams used to denote what one would typically perceived as a tie between two notes looks like a beam for eighth notes which don't appear to be covered in the legend. Pretty much in this notation every beam is a tie so if you just had "|" you would say la, if you had a "|‾|" you would hold it for two beats and so on. The first exercise is actually odd because it groups 5 beats together which is an odd way to start an exercise to teach the basics of rhythm. To simplify this for you, I've written this out in standard notation both with tied examples and what they would be represented in whole, half, and quarter notes. In response to your comment, the claps represent the pulse or the start of the beat which is an important aspect of music. Of course the clap will most likely decay before the duration of the beat like other percussion instrument, but that's fine as it's a device to keep the pulse where the "la" is what is meant to hold the value. A note ends exactly when the next note or rest begins. As you can see, it comprises 5 quarter notes, equivalent to a whole plus a quarter. The final note begins at the end of the 4 quarters and continues until the next note begins, extending the "la" beyond the duration of a whole note. Not the answer you're looking for? Browse other questions tagged notation rhythm teaching or ask your own question. Duration of a quarter note with a 3 written beside it (on a synth display)?